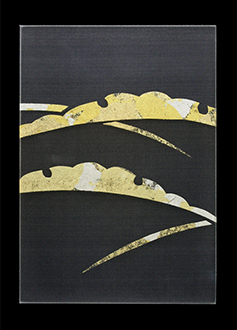 Gold leafing craftsmanship is a superior Kimono technique which is represented as a traditional Japanese art. provides the precious glassdoors and partitions of modern elegance. With artistic skills of gold/silver leaf hand-drawing and gold/silver sand techniques, our authentic silk glass of “Gold Leaf Art” series is created. Our creative service will be available, by order on your special purpose and image aim. 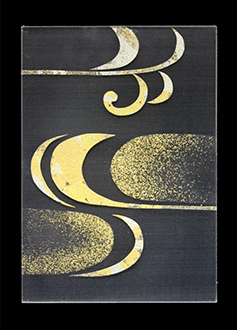 We provide your original pattrns of gold leafing traditional skills on our silk materials such as semi-transparent, embroidered silk fabric and Kasumiginu, Mon sha and others. Semi-tranparnt thin silk fabric, embroidered silk textile and other Kasumi ginu, Mon sha can be available. about 2 weeks after your order confirmation. 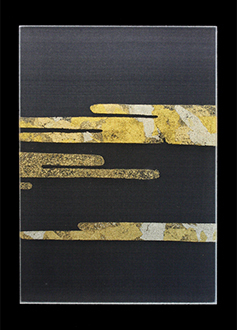 ※ Besides glass laminating, silk fabric with gold/silver leaf is 100,000 円JPY ～ / ㎡ , or more. 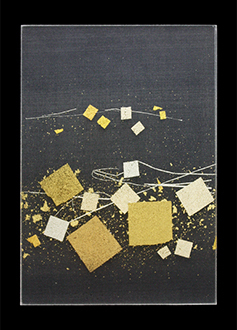 ※ Low iron glass (museum glass) should be more suitable for the artistic effects of gold/silver leaf art. ※ Fabric price depends on gold/silver size, dimension, design, gold/silver quality and leaf color. ※ Each design is hand-made, not the exactly same patterns like printings. Please ask delivery terms.